We’ve raised $1,300 and still counting! Thank you to all. If you would like to participate, you’re invited to leave a donation at the counter at Alternative Grounds, Another Story and Mabel’s Bakery. The photo is from our posting of Oct 25, 2007. 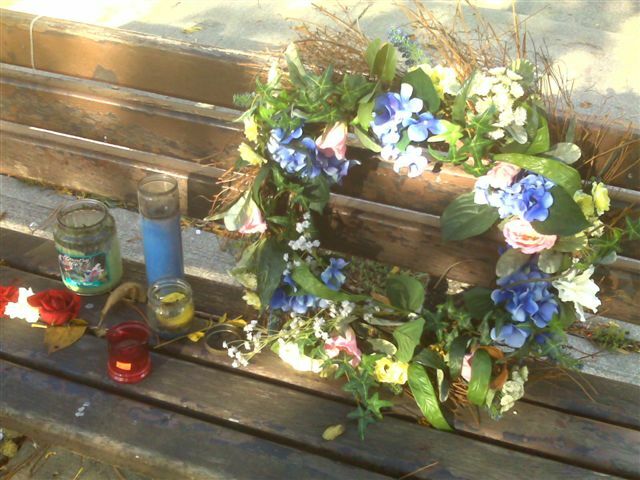 The wreath and candles were placed anonomously in memory of Silvio, a homeless man who was beaten up and left to die nearby. This entry was posted on	November 4, 2011 at 2:10 pm	and is filed under homelessness. Philip, my daughter works on Roncesvalles and knew Tony Clemens well. I was inspired by the stories she told me when Tony passed away. She told me that there is a plan to put a bench in the park as a memorial to Tony. I have a suggestion – let’s raise funds to have a replica of Tony’s camping chair, made out of a strong lasting material (bronze?) and make that the memorial to him. I would be happy to donate some funds towards this. I have no idea who would be able to make the chair, but I’m sure there is someone out there that could. I think this is a great idea too. I like the idea of something that would resemble his chair more than a bench, unless the bench could somehow be made to be a real memorial to Tony somehow.